Low cost carrier Wizz Air has reaffirmed its dominance on the Macedonian market by handling just over 1.4 million passengers on flights to and from the country in 2018, representing year-on-year growth of 14.4%. As a result, the airline held a market share of 62%, while it accounted for 85% of all passengers travelling on low cost carriers to Macedonia in 2018. Despite introducing just one new route to the country in 2018, between Vienna and Ohrid in mid-November, the airline increased its capacity by 18.8% to 1.6 million seats, as it had four aircraft based in Skopje for the entire year and replaced two Airbus A320 jets with the larger A321 model. Since introducing operations to Macedonia in 2011, Wizz Air carried over 5.5 million passengers to and from the country. Wizz Air will continue to expand in Macedonia in 2019. On Monday the carrier revealed it would base a fifth aircraft in Skopje and launch eight new routes from the country's two international airports. The new services will bring an additional capacity of 200.000 seats to the airline’s Macedonian network, totalling over 1.9 million seats on sale in 2019, up 18% on last year. 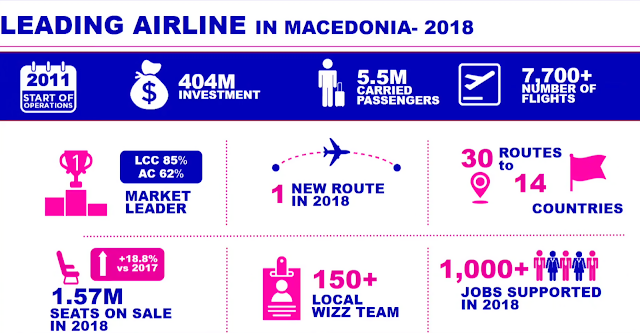 "Wizz’s fast-growing operation in the country will further stimulate the local economy, by increasing employment in Macedonia’s aviation and tourism sectors and supporting more than 1.400 jobs in associated industries in 2019. We stay committed to our Macedonian customers and their visitors and keep on bringing opportunities through affordable travel to the country", the company said in a statement. The Macedonian market has emerged as having the largest share of passengers handled by low cost carriers in Europe. Some 65.6% of those travelling to and from the country are carried by no frills airlines. Macedonia ranks ahead of countries such as Slovakia, Hungary, Romania and Lithuania. The top three airlines in Macedonia based on seat capacity are Wizz Air followed by Turkish Airlines and Austrian. 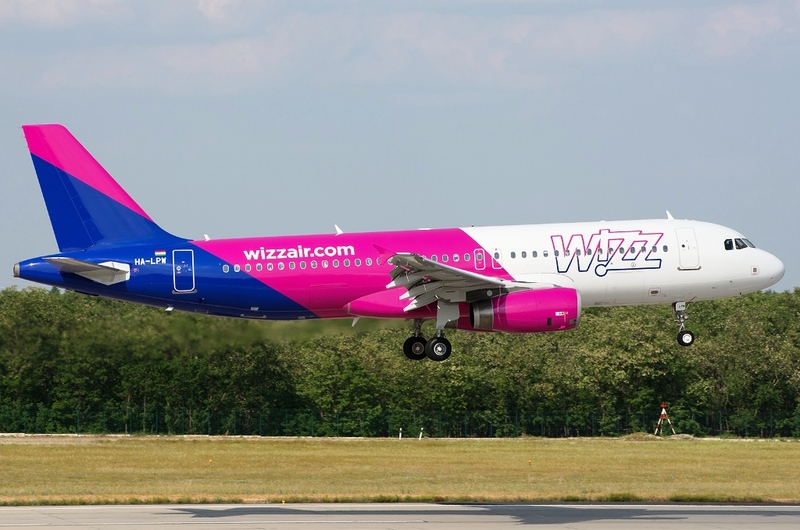 Despite having the largest share of passengers handled by low cost carriers, neither of the three busiest LCCs in Europe - Ryanair, easyJet and Norwegian Air Shuttle - maintain services to the country, with the bulk of passengers flying with Wizz Air. Wow that's more passengers than Adria handles from Ljubljana with a fleet of 12 planes! If you calculate the number of passengers compared to capacity offered, they had a very high load factor. My question is where to from here. It's great they have introduced more new routes but I don't see what else could Wizz launch from Skopje in the future. Perhaps Poland? Turku was introduced for Kosovar diaspora in Finland, which is large. Not for leisure purposes. What is the Kosovo passanger % at SKP? Why would they fly from SKP to Turku when there is DY from HEL that flies to PRN? Makes no sense. When you have subsidies you may have the most exotic destinations in the world. @9.20 because DY is more expensive and the diaspora is not basrd in HEL. I wish them all the luck for Finland route although I am not sure number of Albianians there is so big to justify it. From the other side their all W6 routes from SKP aren't diaspora routes. For example Barcelona is leisure destination, so then why not KEF? They already fly there from many European cities - BUD and VIE as closest to Balkan region. Judging on my experience approx. 30-40%. The number of kosovo-albanians in Finland is not that big. Also with Norwegian flying HEL-PRN weekly this doesnt justify the route at all. Serbia, Albania and Bulgaria, maybe Greece have no direct Finland flights, SKP can attrackt all those. At the end of the day OSL Torp worked out only from SKP! How did Oslo only work from Skopje?? BEG has year round flights to Oslo Gardermoen (main airport) and I think PRN too. Torp is 125km from Oslo. Key word 'Torp', Oslo Torp only lasted from SKP because it had no direct flights to OSL. As for BEG, DY increased OSL to three per week. For your information, Aegean has year-round flights to HEL from ATH. So scratch Greece from that list. official data: you have 9k macedonian gastos and 12k "former Yugoslavia" which probabl means kosovars, and there are 4k "Serbia and Montenegro". Yeah all businesses, Wizz Air included, love to carry bottom feeding backpackers.. not. 10k Albanian speakers in Finland according to 2017 statistics. anon 9.49: so much envy there in one sentence. Any statistics to back up your claim Anon 09.57? Finns that visit the Balkans go to either the Croatian coast or the Bulgarian ones. You can quickly check how many Scandinavian cities are connected to DBV or BOJ for example. Where is the biggest MK diaspora located in Europe? Kosovo albanians, macedonian albanians and albanians make up more than 75% of the passengers from SKP. Do you have a source to back this ludicrous statement? lol, of course he has not. pile of rubbish. I think it depends on the route. When flying Malmö-Skopje I’d say 70% speak Albanian, 25% Macedonian and 5% Swedish or Serbian. lol lies. i am on this route regularly. This is crazy. 60%+ share! If it was a ex-Yu airline Wizz would have called them a monopolist. That share will only increase in 2019. My guess - 70%. Now that's what I call a monopolist. This is not good for competition. All I can say is well done Wizz. Good job Wizz. They have made air travel accessible to many Macedonians and increased tourism in the country. So they had 1,4 mil out of 1,57 mil seats put on sale so their CLF was roughly in the low 90%s. Thats amazing but you have to remember they are ULCC in the Balkans. I don't know what are their prices out of SKP but I guess they are higher than INI and a bit lower or equal as SOF. Still nice money to be made there. They have become more expensive compared to the early years. I remember that Wizz once said that if a route is not pulling a 90% average LF, then they cancel it. Not quite, but let's say there are thresholds connected to routes maturity. I'd say 85%+ is a reasonable criteria for a year-round route that is at least in its third year of operations. High LF%, translated to absolute volume is the cornerstone of any volume based (LCC) strategy, due to economies of scale and volume-based deals at airports. I always groan a little bit when I see claims such as this one. First, on average it's not true, and second, the fare system is programmed to perfectly adapt to demand. The LF goal criteria above would suffice to make the logical leap to why that is. Let's observe facts: W6 average fare doesn't go up on average (yearly statement), new capacity is constantly added and self-cannibalizes the low year-over-year maturity, and there are 10'000 flights yearly (SKP) with each of them having the fare changed 100+ times before the flight takes off..
Aside from aggressive self-cannibalization and the observed fare, there are practically a million possible fare observations in SKP, and the statement that fares have increased is done by anecdotally browsing fares on a few flights. As unscientific as it gets. I do get it - cherry picked examples can always be found, and difference between first and second year of ops can be substantial / noticable. However, past the second year, the market normally stabilizes and any changes are primarily due to capacity gains or losses on any specific city pair. So, unless you provide me with a bloody good analysis fueled by fare scraper data, I'm afraid I'll always call BS. Stop saying nonsense. There are many markets out there, especially in BEG, where LF has gone up but not capacity so average fare has dramatically increased. BEG-BVA is a fantastic phenomenon of this, tickets are never under 25.000 without luggage. For an airline like W6 that flies from the middle of nowhere, it's not worth it. Better to pay 3.000 more and connect with LH. Actually, if LF goes up but capacity and demand stay the same, average fare should decrease, by definition. Just an FYI. Just an FYI that wasn't the case with BEG-BVA. They probably want to boost yields on many routes out of BEG to cover losses in places like VIE. Tranquilis that makes no sense, if LF is over 90% and no new seats are being added then higher fares remain available, not lower ones. There is demand elasticity, so if average fare goes up, LF goes down. We can debate about revenue maximization point, but overall profitability normally goes down for a lower LF for a number of reasons. So, unless demand has increased due to some reason or another, yield (rps, not avg fare) will go up by simply increasing the fare. In addition, none of the routes' economics is tied to other routes it's not competing with, so there are no trade-offs like the one suggested. All of the above is from first hand experience. It's all about hitting that LF/rps demand curve.. So, unless demand has increased due to some reason or another, yield (rps, not avg fare) will **NOT** go up by simply increasing the fare. I just hope Tranquilis didn't visit any higher school for economics. I don't know about BEG-BVA but fares on BEG-LCA have been out of this world. Yes, they change depending on demand and the season but this has also changed over the years. Some years ago they used to charge 5.000 RSD one way during the low season, now it's 9.000 RSD. High fares used to be 12.000 now they are getting close to 20.000. Yes, price elasticity is put into motion but the 'price-bar' has been placed much higher with the passing of time. Wizz Air needs to understand that as an LCC there is only so much their product is worth paying for. Paying 35.000 RSD to fly to LCA on Wizz Air is a rip-off for the product they offer. Also, are you sure price goes down as the plane gets fuller? Last September I booked the last seat available on a LCA-BEG flight and it was 45.000 one-way. A few days before it was around 32.000. Prices *do* go higher as the plane gets filled on any single flight. What I'm saying is that if a price is too high, nobody will buy the tickets at that level, and if that persists, it will decrease after a few days. Now, these are just the principles. Can I vouch 1 or 2/weekly flights are managed properly, given the above algorithm, especially if I'm not doing it myself? Heck no. I've seen some pretty crazy stuff so I'm not surprised people arrive to all sorts of conclusions. I can only hope all of the above makes sense without having been exposed to the topic otherwise. Even most of the other departments in the company would get confused, let alone someone from outside a carrier without a proper variable pricing approach. I understand but what I am saying is that the airline itself is pushing to improve yields on routes that perform well. So the lows won't be as low as they used to be in the past. That's why you see comments from people that Wizz Air is becoming more and more expensive. It's Wizz Air's fault, they built an image of themselves as the €10 per ticket airline. So when someone sees €200 he immediately gets shocked. I get the shock from expectation mismatch. Oh well. 1. If done properly, pricing is 100% demand-driven. If the claim for increased fares is actually true (and it would take a lot to convince me), it's completely driven by people willing to pay a more expensive ticket. 2. Wizz aggressively adds capacity to any market where it sees healthy (sufficiently high) margins, therefore adjusting the supply to demand and helping keep the fares down. There are way too many examples of this. Now, in particular cases of 2/w routes on bases with constrained capacity like BEG (not easy to add +1 weekly capacity on fully utilized a/c, and not much motivation to do so unless there's at least 10+ weekly frequencies calling for increase), it might be the case that they can't respond to fluctuating demand, like in cases of BVA and LCA. It's also much easier to notice fluctuations on such routes due to low capacity deployed, so you might easily jump to conclusions this is actually the overall strategy and extrapolate it to all pricing. Reality is it's just a grain of sand.. So according to you and according to Wizz logic BEG didn't get more flights because there is no demand? Ok.
Because there is **insufficient** demand on existing routes. Re-read the second point from 10:55, especially the bit about 10+ incremental frequencies..
BEG is already busy subsidising JU and JFK and this is the reason why W6 is not happy. They are also claiming that the airport is too expensive for them. Luckily enough, Serbia has an alternative LCC airport, which is INI. Wizz network in BEG is extremely basic, if we look at frequencies then they are pathetic. They are on autopilot mode and that's why they are losing out. While I am all for LCCs and congratulate Wizz and Skopje Airport, I really think the management at SKP must attract more airlines. Well last year they added LOT and Aegean in SKP and Onut Air, Nordica, Brussels in OHD. So they are doing something in that respect as well. I would like Ryan or Easy to come to provide some competition and offer more choice to passengers other than Wizz. ^ they had ample opportunities to apply for state subsidies and launch new routes. They didn't. True but the condition is always to base a plane and no airline wants to do that when they are just entering a matket. I really hope they scrap the based a/c criteria next time around. 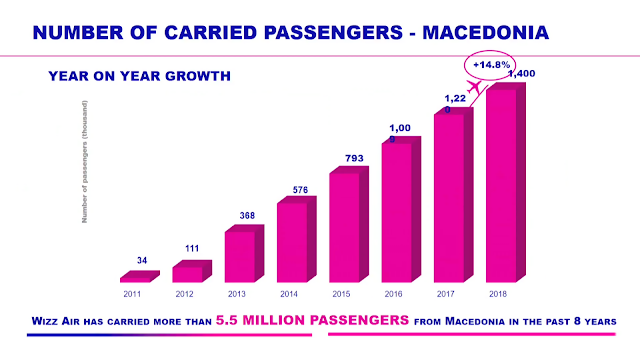 Wizz added capacity to Macedonia each and every year since they started flying which is great. I wish them all the best. SKP puts BEG to shame in terms of W6 expansion and development. Why just BEG? It puts many. But then again they have little competition in SKP and get good money to launch new routes. Because no one has been as generous to Wizz as the Macedonian government (well maybe the Hungarian one). Yayaya Macedonian subsidies are the reason why W6 constantly reduces BEG. Right. How have they "constantly reduced BEG?" They had more capacity in BEG in 2018 then 2017. I simply said subsidies help them grow from Macedonia, on top of having virtuality no competition on any route or any main airport. It's true. They have no direct competition on 38/38 routes. Are you seriously comparing BEG and SKP? If they are not as adventurous in BEG it's because the airport's management has done a better job attracting different airlines to fly there. Wizz Air on the other hand was lured in with the promise of a near-monopoly... which they do have. They don't compete with anyone on any route out of SKP. No point in dragging BEG to the story. The real comparison is to place like Lithuania / VNO. At first it was neck and neck between SKP and VNO in terms of a/c based, now VNO's down to three and SKP up to 5. However, it does go to also show the Ryanair effect.. (let's ignore EU membership and/or Lithuanian diaspora in the UK for the moment). Maybe VNO wasn't as successful for W6 because BT flies to six destinations from Lithuania. Unlike in SKP, they face tough competition there from an airline offering better value for money. Indeed, there are many interesting observations to be made by comparing Lithuania and Macedonia, and it's much more appropriate than any regional comparison (bar SKP/PRN, that one's always amusing). So Wizz will probably have around over 1.8 million passengers in Macedonia this year? It was the best decision to support Wizz instead of creating some Air Macedonia, will done to all. can somebody explain this 404 mil $ of investments? what are those? total cost of those 5 planes? give me a break, that cannot be an investment. PR mambo jambo. Same as the "additional jobs" they create. They calculate them based on an industry report which states how many new jobs are on avarage created when an airline bases a plane somewhere. It's marketing speak. Probably includes the cost of the planes (at list price, not what Wizz pays for them), infrastructure, crewing, advertising and so on. Basically they did not spend $404 million on Macedonia, but it looks pretty in a graphic. Debatable, Petre, debatable. If there are penalties for pulling out and not operating said a/c to full capacity, it's quite an investment. Perhaps the associated exposure / risk is not 100% equal to the investment, however it is quite substantial in the airline business. SKP puts other busier airports to shame. They need to use the Macedonian model to develop LCC network as well. People don't want national airlines, they want cheap ticekts to see the world. The vocal minority in power does want national airlines though, in most places. It'd be funny to calculate propensity to travel in CEE based on pax travelling and population. Would probably shed some light on the success and ROI of places like SKP. Wrong. Airports need a healthy mix of LCC and legacy airlines. With LCC you can only cater to P2P travelers and you have slim to none options for connections. Also, most of these destinations are purely "gasterbaiter" ones. Actually, the 'Macedonian' model has been used as primer and successfully replicated elsewhere with various levels of involvement. One typical example being Georgia. It's also (finally) being partially applied to PRN, though it's less obvious. I'm all for a healthy mix though. I wish Easy / Ryan made an effort and also got a chance to get their toes wet and get proper new route support with no requirements for a/c based. I'll hold my breath as far as major WE flag carriers go though. They either lack the know-how, cost base or necessary focus to make it on such a market, and that's by an order of magnitude. Ti stvarno misliš da je Ryana briga za Makedoniju i da mu ona prestavlja probleme u spavanju? U stvari misliš da Ryan uopće zna da postoji Makedonija i gdje se nalazi? Not true. Currently no route is subsidised. From March it will be the new routes they are launching. Fake news. Move on, nothing to see here. Wizz Air needs to keep on dominating in SKP because that's their last fortress in ex-YU. Tuzla isn't far from it but given Ryanair's recent expansion in BNX their performance might be affected due to overlapping catchment areas. Not to mention that Banja Luka is much larger and wealthier than Tuzla. Their biggest mistake was not being more aggressive in BEG, the single largest market in ex-YU. They started out strong but over time they lost steam while other airlines have added flights thus securing their own piece of the ever-growing pie. Two great examples of this are Barcelona (VY) and Berlin (U2) which were two large markets they ignored for years. We can also add Oslo as since they suspended Torp flights, DY has increased OSL from one weekly to three weekly flights, even in winter. Will be interesting to see what happens with BSL-BEG now that easyJet launched their own flights and with Paris with Air France and ASL Airlines entering the market. INI was another great example where Swiss and Ryanair messed up their plans. Market there obviously couldn't fill all those seats and they were the first ones to give in. LJU is another market they have stubbornly ignored. Look at what Transavia did in LJU, not only have they stimulated demand but have also caused ZAG-AMS numbers to come crushing down. Why didn't W6 consider EIN-LJU? I am sure two weekly flights could have done just fine. You snooze, you lose. SKP is their only ex-YU hub that has continuously grown and where new destinations were added almost every year since the first flight was introduced. For the time being this market seems like their only remaining safe bet od Triglava do Vardara. Let me tell you this though - Wizz would've deployed 4-5 a/c and qualified for Air Serbia level of airport taxes a few years ago had there been any trust in BEG retaining the published taxes once they went ahead with it. It is not really a safe bet though. The moment Ryanair bases some planes in PRN, the numbers will crash. This is why W6 is expanding in PRN despite canibalizing their own SKP flights. BEG would have respected the deal if a legally binding contract was signed between the two sides. Look at what happened in INI, €3 are kept regardless of who owns/runs the airport. If BEG didn't respect the deal Wizz Air would have won in court. Unfortunately it was just APD published charges, so no opportunity to 'contract' anything. Of course, that's probably because no Serbian government would be willing to let go of JU. It would be political suicide. However there are more than enough markets which could have worked by undercutting legacy carriers, Berlin being a prime example of that. I am still surprised such a market was ignored for so long. This winter there are 11 weekly flights on two airlines, the market is obviously there. Not to mention that JU is easy prey, they are fundamentally incapable of winning out against their competitors. What is the future of wizz in beg then? There you go, we arrived to the crux of the matter very quickly. And I agree with you there are quite some opportunities missed. However, it's very easy to see why from where I'm sitting. Even in perfect conditions, unless there's an internal sponsor keeping an eye on a certain market and actually having proper market insights and actively selling it, this is bound to happen. If somebody let me have my way, I think BEG would've been chasing at least 7-8 mil by now, but here we are. SKP just goes to show what can be done with some proper focus and commitment. SKP just goes to show what can be done with some proper focus and commitment and lack of competition. There I fixed it for you. Hey, you can either whine about a non-existing market or no competition, take your pick of belittling attitude. Good news, more seats, might push fares down as well. It's also good to see W6 flying to more and more main city airports, as well as so called "exotic" destinations from Skopje. It's time for them to finally acquire a Macedonian AOC. Subsidiary and AOC scenarios are simply unsustainable. Cases in point are Ukraine and Bulgaria. UK is something completely different of course. I imagine the based capacity equivalent to be at the very least in the teens there, quite a bit of a stretch from four or five. But to shed some light on the topic - there's a certain positive threshold in terms of incremental (!) profit and strategic impact necessary for such a scenario to be justified. It seems to be there is gross underestimation of costs and focus necessary to operate a subsidy / AOC, let alone the ripple effect of such a signal across EMEA should it come to light. What's this obsession with AOC? At the end of the day, what kind of benefit would this bring to Wizz Air? From 34,000 to 1,4 million. Wow! I think it is time for another LCC to be introduced in SKP. No interest, market demands are covered by W6. Soon they will chase out most competition. Does Wizz Air now fly from Frankfurt's main airport? If they do this could be a good route for them from Skopje or other ex-Yu bases. Yes it does. It flies to FRA and connected daily to BUD and SOF. Turku makes sense...it looks weird, but it will work good. Reason? Meyer Turku yard that makes cruise ships. I just came from there (opening of new Mein Schiff 2) and there is at least 4000 people from Kosovo or Albania working there as subcontractors and sub-subcontractors in different areas, from steel cutting to final assembly of parts. For them, this like will be a pure gift as it will allow them to go home in less than 3 hours instead to drive to HEL and fly from there. I think that's ridiculous that they Claim 540 M investment, same as Ryanair sometimes does. Still a low single digit million more than anyone else does.